Two separate downloadable ZIPs of presets are available at the end of this post, one for “Process Version 2012”, the standard develop engine to use for photos newly imported into Lightroom 4, and a ZIP of presets for “Process Version 2010”, which was the standard for Lightroom 3 (and remains the develop engine for those photos even in Lr4 and later, unless you explicitly change the process version in the Develop Module). Be sure to use the preset appropriate for the photo's process version; otherwise, the preset appears to do nothing. In the presentations below, mouseover the little tone-curve squares under each screenshot to bring up an example of the preset to the screenshot. All the screenshots for a particular section are loaded upon first mouseover in that section, so there may be some initial delay with each if you're on a slow connection. 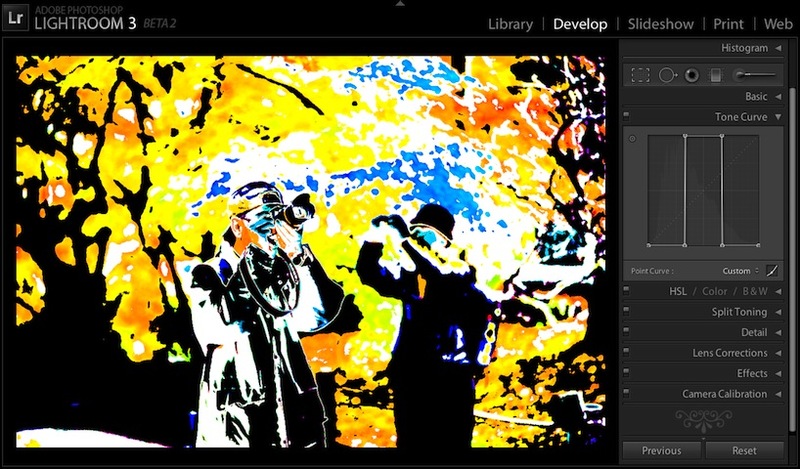 Like all “wild” tone curves that target specific parts of the histogram, the result for each is highly dependent on the specific photo and its current develop settings — tiny adjustments to a slider can have sweeping, dramatic impact — so the screenshots below show just one view that's likely not at all representative of what you'll see with your photos and settings. By the way, the photo is from my autumn “Teeming Throngs Enjoying the Colors at Kyoto's Eikando Temple” post. Install instructions are in my previous post. In coming up with these presets, I tried not to be limited by what might be useful, though I did draw the line at a set of randomly-generated curves (after giving it a few trys 🙂 ). This was all a monumental waste of time to build and writeup, but it was fun. On the odd chance that you find any of them to be actually useful, leave a comment with a link so everyone can see. I think Ron and Grandma are completely missing the point. Reminds me of a graffito I saw in the Math department 35 years ago in college. Your last Sliver series reminds me of my earlier work with Agfa Contour film. 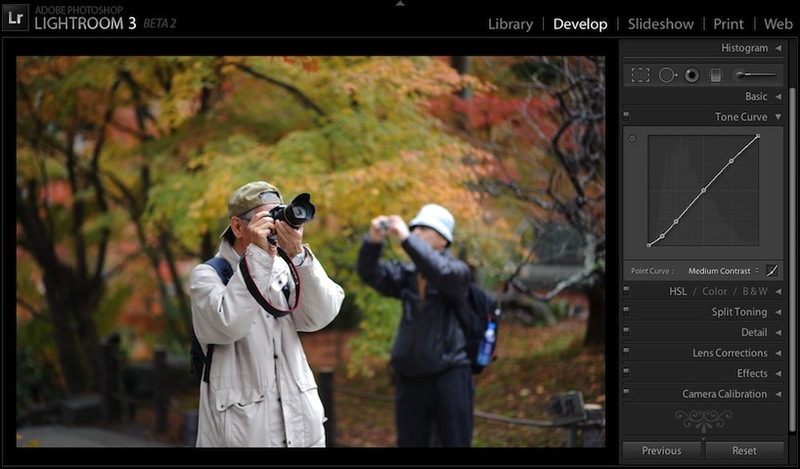 Needless to say a lot easier in Lightroom or combined in Photoshop. strange things to do with your photos highly psychadelic and lots of fun! WOW!!! You opened my eyes. Never thought there was that much flexibility in the tone curves in 3! Side Note: I want to thank you for all the amazing tools you have created! how do you move the end points (black and white) up and down? the curves. This was one of the most educational posts I’ve seen in a long time. Love it! All of the presets may not be useful for photographers’ workflows, but they are immensely useful to convey the ways and extremes in which digital pictures can be manipulated. Hi, my 15 year old granddaughter has started a 2 year photography course as part of her GCSEs (age 16 final exams in the UK). She was having trouble understanding tone curves, but these presets are a fabulous educational tool, demonstrating the tone curve in an entertaining way! Really enjoyed your blog. Many thanks for taking the trouble to do this. I just do not understand those with their negative comments. You are really helping an awful lot of folk here. Really inspired stuff and I’m so grateful for these great ideas. I’m a keen photographer / artist and will definitely keep my eyes on your blog.